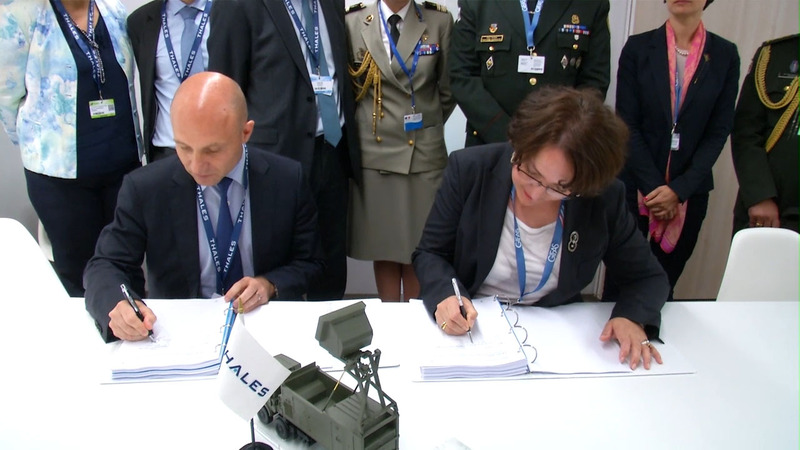 Georgian Defense Minister Tina Khidasheli signS an agreement with ThalesRaytheonSystems CEO for French operations Jerome Bendell. Georgia and France have finalized a blockbuster air defense deal that was the source of a major political crisis in Tbilisi last year, though many of the details of the deal and the crisis remain shrouded in mystery. Defense Minister Tina Khidasheli on June 15 signed an agreement with the company ThalesRaytheonSystems in Paris on the purchase of “advanced” air defense systems that will “guarantee country’s air defense,” Khidasheli said, according to Georgian news website Civil.ge. But that's about all that is known: the exact type of system, its price, or anything else is being kept secret. “I cannot speak about the details of the agreement we signed today. Information about such type of procurements, weapon should be top state secret, otherwise we can now continue our conversation in Russian and they will not even need to spend money on translation to learn information about this agreement,” Khidasheli told the Georgian state broadcaster. Former Defense Minister Irakli Alasania, who initiated the process of purchasing French air defense units, was unexpectedly fired last year. In April, he made the sensational claim that he was ready last October to sign the deal but it was sabotaged at the last minute by Prime Minister Irakli Garibashvili and former Prime Minister Bidzina Ivanishvili, and implied that they did so at Russia's request. The claim renewed suspicions among many Georgia watchers that the current government is excessively deferential to Russia while it claims to be pursuing NATO membership and cooperation with American and European militaries. Improved air defense systems has been identified by Alasania and other Georgian defense officials as being one of the most important priorities in protecting Georgia from a potential Russian attack. So does this new deal prove Alasania wrong? It's still hard to say. In response to the new announcement Alasania said that he didn't know the exact content of the deal and that it would be up to parliament to examine it. “For me it is important that the agreement, of which I signed the memorandum, would be implemented 100 percent,” Alasania said, reported Georgian news site Democracy & Freedom Watch. But the fact that the deal is with ThalesRaytheonSystems is already suggestive. Alasania had said that the goal was to be able to shoot down Russian Iskander rockets. That indicated that Georgia was seeking the SAMP/T system, according to Georgia's leading defense analyst Irakli Aladashvili. But that system is manufactured by a different company. Photos released by the Georgian Ministry of Defense in their announcement of the deal show the ThalesRaytheonSystems Ground Master 200 radar and Crotale missiles, manufactured by Thales Air Defense. Those are improvements over what Georgia has now (Russian Buk systems) but not as capable as the SAMP/T would have been, Georgia analyst Michael Cecire told The Bug Pit. "So, there still may be something to Alasania's allegations, given that Georgia has purchased arms from a different French company," Cecire said. "But it does undermine the notion that the Georgian leadership is somehow against purchasing Western defensive arms." Khidasheli also said that another arms deal was being prepared with France and would be signed "in a few weeks." Stay tuned.